Hi guys, at last I'm back with My Selangor Story blog post! =) Hope you didn't missed out my MSS Day 1 Stories about FireFly, i-City & UpTown Shah Alam [Be patience as there are tons of photos to load]. The breakfast @ Carlton Holiday Hotel was so-so only but it is enough to help me survive for another morning =) A few bloggers found little cockroaches inside their hotel room, so do I! Therefore I hope Carlton Holiday Hotel will hire a pest control agency when they see this ya. No one like to sleep with this smelly creatures in the same room. Royal Selangor Visitors Centre @ 皇家雪兰莪 is our destination after the breakfast. The first thing that catches my eyes is this huge tankard. It is recognized as the World's Largest Tankard by Guinness Books of Record. The Royal Selangor Visitor Centre is a 20 minute drive from Kuala Lumpur’s city centre, if you are making your own way here. Alternatively, this is a popular destination on the local tours which you can book through your hotel concierge. Do ensure that this destination is specified in the tour itinerary. Taxis are easily available from any part of the city. 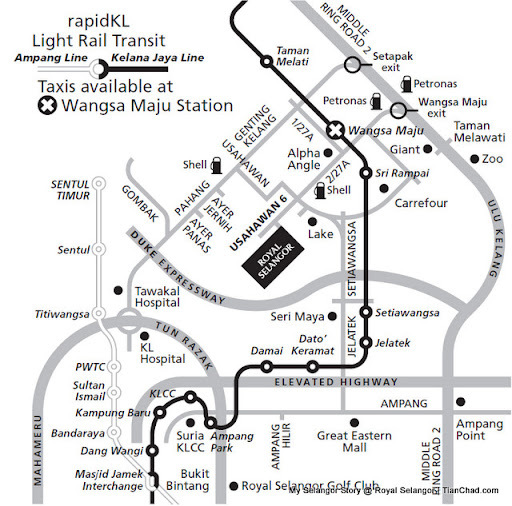 Take the PUTRA LRT, alight at Wangsa Maju station and hop into a taxi to take you to the Visitor Centre. Free parking, Ample parking space for car, and up to 15 parking bays for coach buses. Royal Selangor was founded in Malaysia in 1885 by Yong Koon, the Royal Selangor pewter factory is based in Setapak, Kuala Lumpur with a workforce of more than 300 skilled craftspeople. We were briefed by the Royal Selangor staff about their history along the way. Above are some pewters appear in different kind of shapes and used as money currency during old time. Money Tree, tortoise, elephant or even crocodile shape pewter. I personally like this Altarpiece Candle-stand very much. The handwork looks really fine! There is a story behind this melon teapot. Amidst the mayhem, Ah Ham the villager saw a beautifully crafted teapot. The pot, shaped like a melon, mesmerized him. As he bent down to pick up this captivating teapot, he heard a piece of shrapnel whizz just above his head. Did the Melon Teapot save his life? The melon shown as above is the replica of the original one. Today, Royal Selangor has reproduced Yong Koon's masterpiece in a brilliant finish as well as a version in a fine, burnished antique finish, with a matching sugar bowl and milk jug, complemented by a scallop-edged pewter tray with intricate melon skin motif on it. Every Pewter finished product will be sealed with this touchmark. 玉和足锡 means "Jade Peaces Pure Tin"
This is the magnified version of Money Tree that people use as money currency. Can you see the Arabic inscriptions carved in the coins? Even TianChad Batman also take picture with it for lucky "money money home"
Do you know that Pewter is the combination of Tin (Sn), Antimony (Sb) and Copper (Cu)? We were then brought and taught about the process of making a pewter during the factory tour. The different pewter production processes involves casting, filing, polishing, soldering, hammering and engraving. We have the chance to experience it our selves for this hammering process, it is really really hard and need good consistency+accuracy! Cos if you hit wrongly the whole pewter will looks failed but still can melt it and recycle again. There are lots of experienced Royal Selangor staffs working in this factory. It is so huge with various kind of Pewter Product. The intricacies of making Selberan’s fine jewellery. She is wearing the special magnifying glasses. The Royal Selangor ‘School of Hard Knocks’, is an entertaining pewtersmithing workshop where for a small fee participants are taught to create their own pewter dish using traditional tools and methods. It is a good way for people to release stress as you need to knock as hard as possible to have a smooth surface on your pewter dish. My serious looks when hammering the plate into a dish. People say when a guy is doing something seriously, he looks a lot more handsome. So do I deserve the label? Lol! By the way, thanks Nicole for capture this! Manage to capture the sculpture picture of Mr. Yong Peng Kai, the ex-chairman of Selangor Pewter Co. Sdn Bhd before we head to The Café @ Royal Selangor Visitor Centre. He looks kind and proud with his career. We were served with good refreshments at The Café. It definitely taste better than the breakfast @ Carlton Holiday Hotel. We were so proud to have Datin Paduka Chen Mun Kuen, the director of Royal Selangor. She is also the granddaughter of Royal Selangor's founder! Instead of telling us the story of Twilight Saga, she tell us a story about the Melon Teapot Saga. Year 2010 made Royal Selangor 125 years old and I wish them do better day by day. You can now buy their Royal Selangor pewter frames, tankards, goblets, wine accs, premium or specially crafted pewter through the Royal Selangor Online Store. It is so coincidentally that me and her have the same surname - Chen. Probably we are having the same ancestor? Glad to have a picture with her happy smile~! Get your personalized pewter from Royal Selangor now~! Here is a video that compile almost all of what happened during my visit to Royal Selangor Visitor Centre and School of Hard Knocks =) Please comment about the video~? So where we head to after Royal Selangor's visit? Stay tune on this site for more picture stories~! It is! Especially when more than 20 people knocking together!